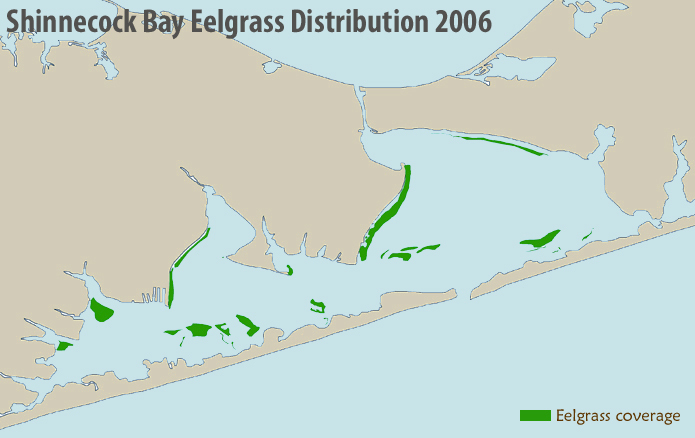 In the Peconics, most of the eelgrass currently exists east of Shelter Island, but prior to the "wasting disease" and brown tide outbreaks, it existed in nearly every creek and cove in the estuary. Using historic aerial photography along with confirmation with local baymen, the estimated area of eelgrass coverage in 1930 was 8720 acres. 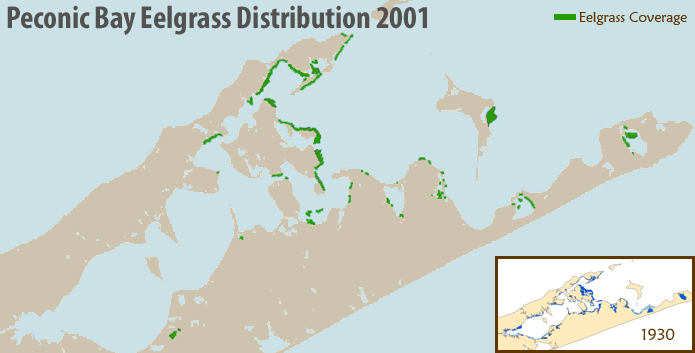 As of 2001, with the use of 2001 aerials and ground truthing (learn more...), eelgrass coverage dropped to 1552 acres in the Peconics. This means approximately 85% of eelgrass has been lost in the Peconics as of 2001, and unfortunately we have continued to see a decline in coverage at some of our monitoring stations in years since. Most of our work in the South Shore Estuary has been in Shinnecock Bay, so this is where we are most familiar with current eelgrass coverage. Using 2006 aerial photography along with ground truthing, the current distribution of eelgrass in the bay is shown above. We have recently began working in Great South Bay and in Hempstead Bay, and hopefully time and resources will allow for further exploration of these areas.